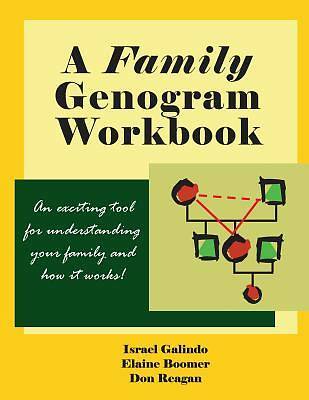 A Family Genogram Workbook, by Israel Galindo, Elaine Boomer, and Don Reagan, is an easy to use, but powerful, guide to understanding your family and how it shaped you. This workbook will take you step-by-step to learn how to create your own family genogram. A genogram is an exciting tool for understanding and interpreting family history and relationships. By working through various exercises and activities in A Family Genogram Workbook you will gain insight into your family and your place in it. The workbook has four chapters. The first, a tutorial, shows readers, step-by- step, how to create their own family genogram so that they can quickly reap the benefits of this powerful tool for understanding family emotional process. The workbook format contains work pages so the reader can create a genogram right in the book. Subsequent chapters provide basic information on how to interpret and how to use the genogram. The chapter titled The 20 Questions to Ask About Your Family will help readers focus on key issues related to family emotional process. By working through various exercises and activities in A Family Genogram Workbook readers will gain insight into their families, how they work, and their place in it. Along the way, readers will also acquire an understanding of basic Family Systems Theory concepts and terminology. This resource is suitable for courses on family systems, social work practice, individual or group study, marriage and family retreats or workshops, for premarital counseling with couples or blended families, coaching relationships, or for personal use.